It was with some trepidation that I agreed to accompany a friend of mine down from Northern Illinois to Missouri for the second annual Ozark Foothills 50K/25K in April. I had a fairly full race schedule already, but the race director, Shalini Kovach of Terrain Trail Runners, is a friend of mine, and I’d never run her home trails. So, I thought, why not? A 50k sounds like a great idea! Scott Laudick levitates down the trail. Knowing what I do now, I can say that it was a great idea. Ozark Foothills is a gem of a race, taking place in forested Greensfelder County Park just 25 minutes from St. Louis. 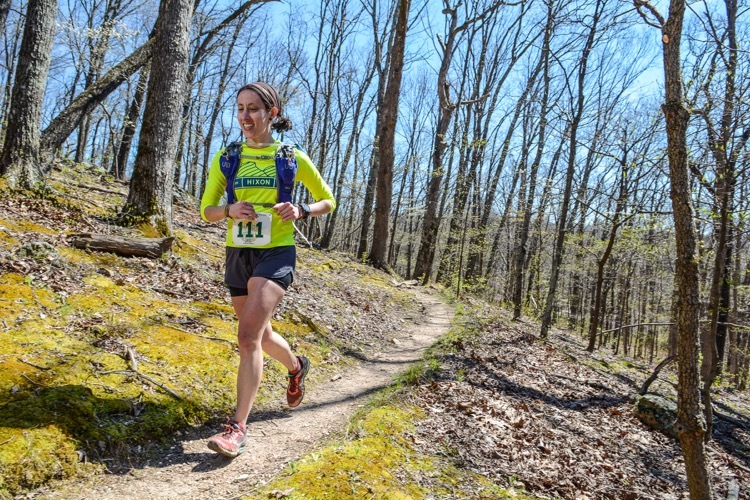 Along with a scenic and challenging course, two distinctions make it a special opportunity for trail runners from across the country: it was recently named a USATF Ozark Mountain Ultra Trail Championship race, and it is also a part of the 50K MASHUP Series, a collection of six 50k races across the Midwest that offers recognition and awards for those who are able to complete five of the events. This year’s edition of Ozark Foothills started on a crisp morning, the temperatures hovering around 30 degrees. Trail conditions were said to be ideal, and new course records were expected (and, I found out later on, achieved!). In typical low-key fashion, Shalini counted down from three, two, one…and we were off. The route was marked well, and the hills were long but runnable. I loved the downhills in particular. Not too steep, and begging for speed. Approaching the first aid station was a long climb, the kind that goes on forever. No wonder the aid station is named “What the Hill! ?” But the volunteers were happy, cheerful and ready to help with whatever task was needed. In fact, that was the case with all the volunteers. What followed was 25 or so more miles of trail running bliss. The course is filled with runnable sections, with just enough rocks and roots to keep you present. I nearly tripped once while drifting. But mostly, I had a blast, chatting with other runners and enjoying the chilly but beautiful day. This wasn’t my fastest race. It wasn’t my most well executed race. It was, however, one of my favorite races. The terrain was almost all single track, with dogwood and redbud starting to pop, and mayapples at about ankle height. The volunteers were amazing. And the atmosphere was laid-back, old-school ultra. At how many races do you see the race director cheering each finisher by name and congratulating him or her with a big, warm hug? And the delicious post-race barbecue and craft beer didn’t hurt, either. If you need an excuse to visit Eastern Missouri, you could do a lot worse than paying Shalini and the Ozark Foothills 50K/25K a visit. As for me, I’ll definitely be back!